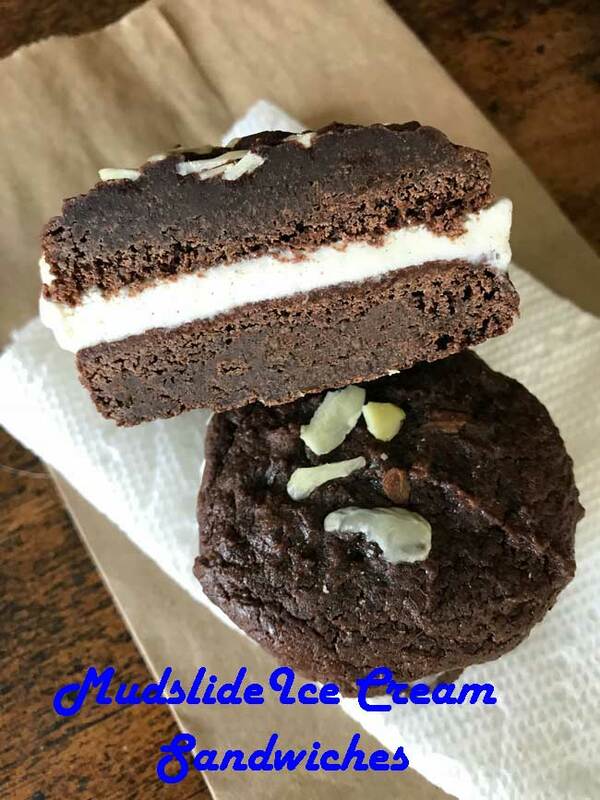 Originally from an old issue of Allrecipes Magazine, Mudslide Cookies are soft and chewy double chocolate cookies that can be served alone or made into ice cream sandwiches. We like them both ways, but they work well for ice cream sandwiches because they don’t get rock hard when frozen. As for flavor, these Mudslides call for an interesting blend of unsweetened chocolate, semisweet chips, butterscotch chips and cinnamon. For a more traditional flavor you can leave the cinnamon out. The full recipe gives you about 36 cookies – enough for about 18 sandwiches. If you only need 12 or 24, you can make 1/3 or 2/3 of the recipe pretty easily. It's fun to mix and match these cookies with different flavors of ice cream. When frozen, the cookies get firm and chewy, but not so hard that you can't bite into them. Preheat oven to 350 degrees F. Have ready two or three large baking sheets lined with parchment paper. In a saucepan set over medium-low heat, melt the butter, unsweetened chocolate,chocolate chips and butterscotch chips. Remove from heat and stir to make sure chocolate is fully melted. Stir in the cocoa powder, then stir in both sugars, the eggs, vanilla and coffee. Stir the flour, baking powder, salt and cinnamon together in a large mixing bowl, then add the chocolate mixture to the flour mixture and stir until blended. The batter should be soft, but it should hold its shaped when scooped. If for some reason it seems runny, allow it to stand for a few minutes. Using a medium size cookie scoop, Scoop 12 mounds onto one of the parchment lined sheets. If desired, sprinkle tops with nuts. Bake for 8 minutes. Repeat, using remaining cookie sheets and baking one sheet at a time, until all cookies are baked. After baking, allow the cookies to cool on the baking sheet for 2 minutes, then carefully transfer to a wire rack and let cool completely. If making ice cream sandwiches, put them in a freezer bag and freeze until solid, then sandwich cookies with small scoops of ice cream. Wrap individually.